Electro-hydraulic harness kit is standard. Recommended Tractor size: 10,000 to 25,000 lbs. The HLA Quick Attach Snow Blade Mount is securely connected to both the front and rear of your tractor. Relying on the rear of the mount, the force is pushed through the drawbar from the front of the mount providing incredible pushing strength. Also using parallel linkage, you can rest assured that the blade will always remain parallel to the ground whether it's raised for stacking snow or at full angle. 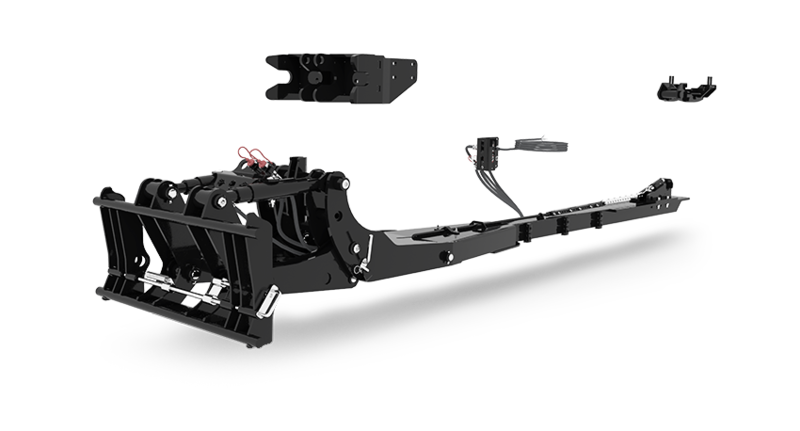 The quick release design relies on front and rear adapters fitted to the tractors chassis. With the hydraulics connected down pressure on the blade allows you to raise the SB4QDM aligning it with the front bracket. Once engaged reversing the pressure raises the rear of the SB4QDM locking it into the rear bracket. Available for most makes, the quick attach mount includes all hardware, hose kits and electro - hydraulic wire kit allowing for easy installation.